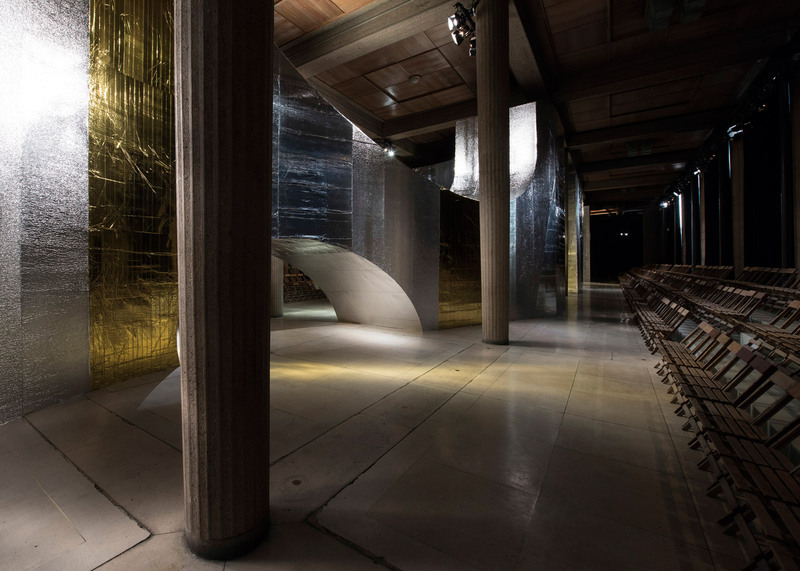 A "timeless ruin" covered in reflective materials was installed across the runway at Italian brand Miu Miu's Paris fashion show by Dutch studio AMO (+ slideshow). AMO – the research arm of OMA – continued its collaboration with fashion designer Miuccia Prada to create the set design for her Miu Miu brand's presentation during Paris Fashion Week on Wednesday. 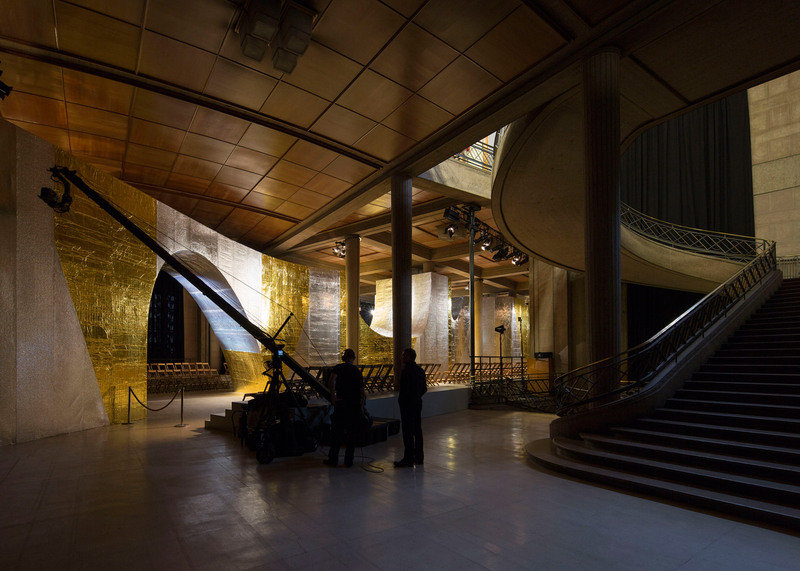 The show took place in the hypostyle hall of the Art Deco Palais d'Iena, designed by French architect August Perret in 1937. Among the building's rows of columns, AMO installed a giant structure that snaked through the space and was punctured with angled arches. 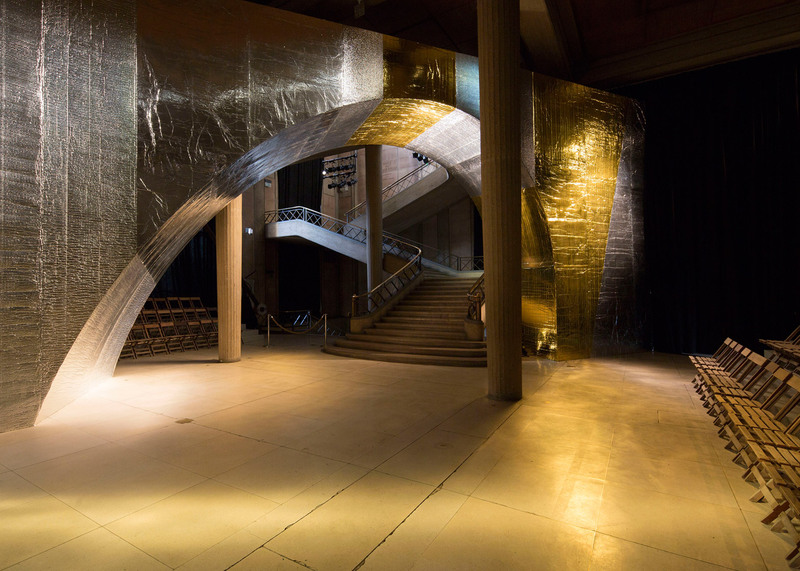 "For the 2016 SS Miu Miu show AMO invades the monumental architecture of August Perret's Palais d'Iena in Paris with a timeless ruin, introducing a dramatic counterpart to the rigorous linearity of the Palais," said the studio. Beginning at the grand staircase at one end of the room, the arches spanned back and forth across the space. Models paraded along a route created through the gaps and between the columns. "The volume, embedded in the hypostyle, is carved following the model's path," AMO said. "Concealing and revealing the columns, an organic dialogue is established with the existing architecture." 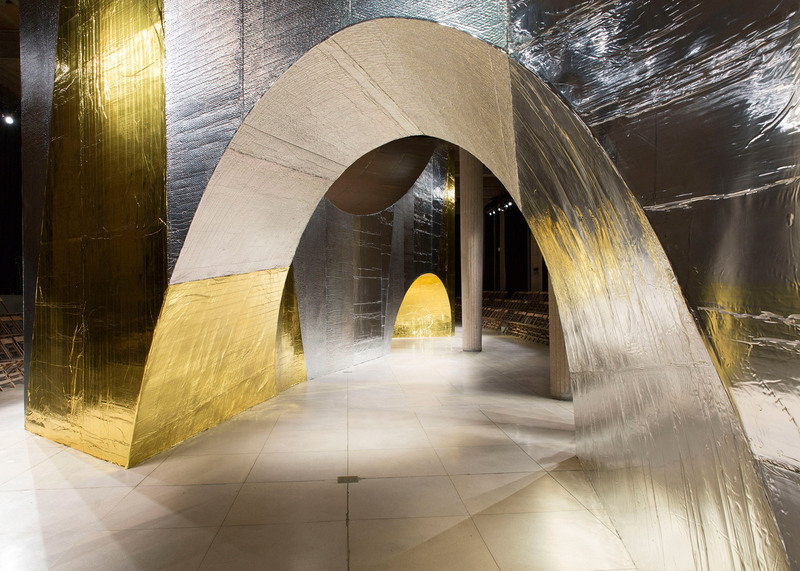 Gold and silver-coloured materials with varying textures and mirrored qualities were used to cover the entire structure. "The complex geometry of the installation is clad with a set of industrial reflective materials amplifying its extraneous presence to the surrounding environment," said AMO. Spectators were arranged in lines around the edges of the space, seated on modest wooden chairs. "The audience is organised linearly along the perimeter of the hypostyle facing the constant changing relationship between the Palais, the injected architecture and the fashion," said AMO. "Based on this concentric organisation, the show unfolds around the brutal volume that becomes both path and background for the models." AMO created a pop-up nightclub in Paris for Miu Miu earlier this year, and has also designed the Milan catwalks for sister brand Prada. Larger projects created as part of the ongoing collaboration include the Fondazione Prada arts centre in the Italian city, which opened in May and features a bar by Wes Anderson. Although Swiss architecture firm Herzog & de Meuron was chosen to design Miu Miu's box-like store in Tokyo's Aoyama district. The Spring Summer 2016 edition of Paris Fashion Week, which took place from 29 September to 7 October 2015, also featured Hussein Chalayan's catwalk shower that dissolved a pair of soluble outfits and Akris' collection inspired by Sou Fujimoto.